I’m a man of many hobbies and interests. One of my favorite pastimes is the art of photography. I consider photography an art form and love taking pictures of nature, architecture and all sorts of things. One thing I have never understood the appeal of is the selfie. I see myself every day in the mirror and I have concluded that I am not an attractive fellow and the less I have to stare at my mug, the better. Due to this lack of desire to see pictures of myself all the time it was with some trepidation that I took the challenge of reviewing several selfie sticks. There were three candidates with different features that I chose for this review. The three different selfie sticks came with a few minor differences but all had the same function – to enable you to take better selfies. I graded each on their packaging, their build quality, the ease of use and so on. Each of them had different pros and cons but there was still one that I believe was the definite winner. Keep reading to see which one wins! This was my first selfie stick and I unfortunately wasn’t all that impressed. You could tell that it was the cheapest of the options. It is now listed on Amazon for $2.99 (on sale from $9.99). Once I removed the selfie stick from the package the mirror (which looks nothing like the mirror in the pictures) fell off. It went back on pretty easily but fell out when the selfie stick bumped against anything. The stick felt relatively flimsy but didn’t bend or buckle when I put light pressure on it. The stick itself did the job relatively well and worked about the way that I thought it would. One advantage of this selfie stick over the others was that it doesn’t need to be charged. Instead of using Bluetooth it plugs directly in to your headphone jack and then with a press of a button it takes the picture. The headphone jack cord was a little short but it was workable. 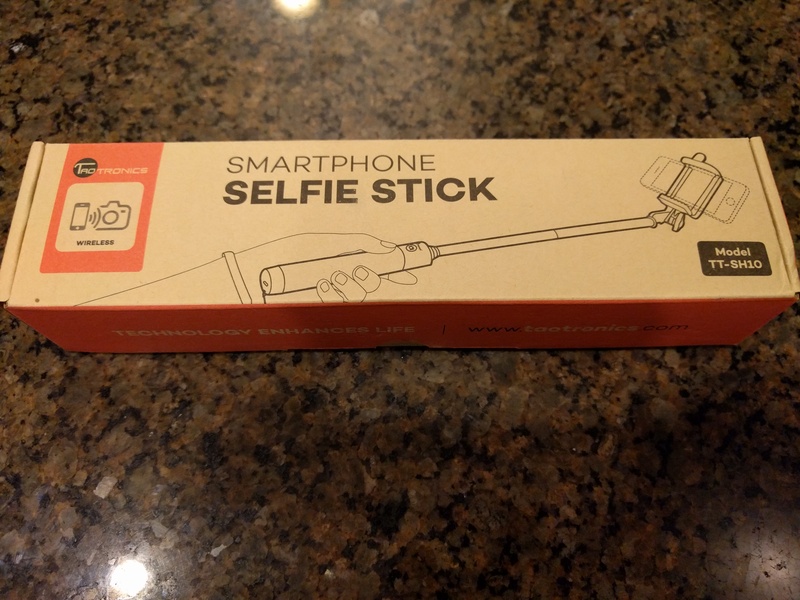 Our second selfie stick was from TaoTronics and is now listed on Amazon for $11.99 (regularly priced at $49.99). The packaging it came in was simple but solid. Unlike the Generic Selfie Stick it fit the entire contents of the package and did it without any bulges. The labeling and directions on the box were in clear English and weren’t a poor translation from another language. The selfie stick came pre-assembled with an optional lanyard that you could attach to the handle. It came fully charged, but it came with the required charging cable in case you went crazy taking selfies right away. The directions were very straightforward and it was extremely easy to use. The manufacturing was very sturdy and was not flimsy in the least. I felt like I could use it without having to worry about it snapping in half. The only issue I had with this was that the Bluetooth connection between it and my phone took forever to set up (and keeping in mind “forever” is relative term, it really only took about ten seconds). Once it was established there was no dropping of the connection and I was able to take pictures almost at the exact second I pressed the button. All in all, this one was a good contestant and up to this point it is my favorite. Keep reading to see how the last entry holds up! 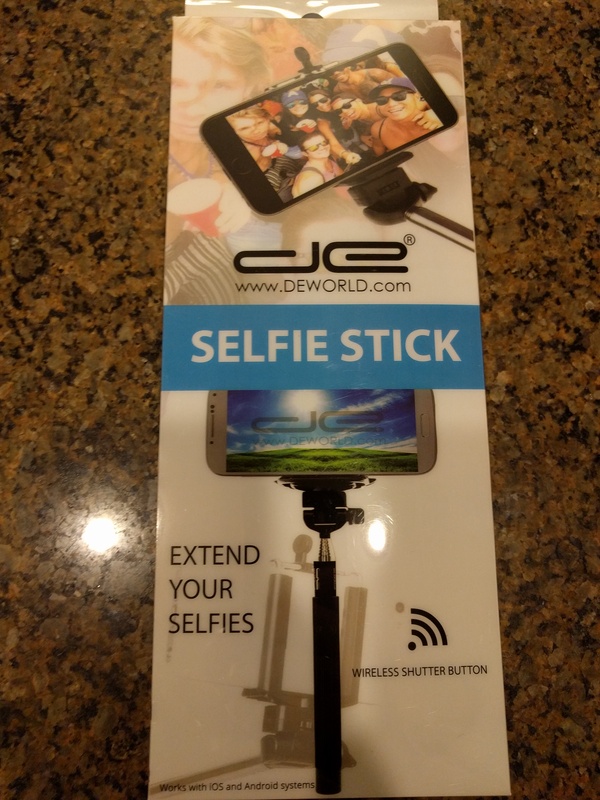 The DE Selfie Stick also came from Amazon and is listed at $12.99 (regular price of $29.99). The first thing I noticed about this one was the size of the packaging. It came in a package almost three times as big as the other two selfie sticks. It was 10.5 x 4.25 x 1.25 (LWH). The next largest package was 8″ x 2″ x 1.25″ (LWH). It felt pretty flimsy and bulky when compared to the others. The package contained some directions, a USB charging cable and the device itself. The selfie stick comes in two main pieces; the stick and the phone holder. The nice thing about this selfie stick is it uses a standard tripod screw mount so that if you wanted to you could in theory use it with a standard camera that supports Bluetooth remotes. As I dabble in photography I found this to be a very valuable option, one that neither of the competing brands had. The phone holding bracket was nice but struggled to go wide enough to fit the Note 2 I was using for testing. It fit all of my other devices just fine but the Note 2 was right at the edge of its limits. The bracket had a rubber mount on the bottom piece that was supposed to help hold the device in place, it did so but it did it at a slight angle. I had to keep that in mind when taking pictures as it threw them off just that little bit. One really nice feature about this selfie stick was the Bluetooth. Two of the devices I tested had Bluetooth and one used the headphone jack. When connecting any of my test devices to this one it was about twice as fast as the other Bluetooth device. When using it to take pictures it was an instant take. There was no delay between my pressing the button on the stick and it registering on the phone. I was very impressed with this selfie stick and would definitely recommend it to anyone who needs one. 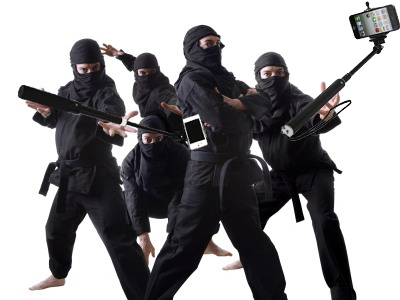 After a lot of careful deliberation I decided that my favorite was the TaoTronics Selfie Stick. When it came down to it it was the device that had the best all around results. The only complaint I had was with the first Bluetooth pairing but after that things just worked. The DE was a close second with the universal tripod mount and the fast pairing on the Bluetooth but the issues with the mount kind of turned me off. We won’t even go into why the Generic Selfie Stick didn’t make it… Be sure to check them out via the links and the gallery below and let us know what you think! Kindle E-Readers Receiving Much Needed Update! Wireless Charging for the Honor 8!! !